Last year I snapped up a cool old globe for 50 cents at a yard sale and I used chalkboard paint to make a Scary Places Halloween Globe. Well, it’s been sitting in the garage since last Halloween and I’ve been thinking about how to change it up for this year without ruining the chalkboard paint. I got lots of coordinating ribbon and just added strip after strip to the globe until I liked how it looked. Because I don’t want to ruin the globe itself, I opted to adhere the bottom layer of ribbons to the globe with double sided adhesive so I could take it off again. I love the little tacky dots because I can get them onto the ribbon with one hand. Press the ribbon to the dot and it comes right up. Stick one end of the ribbon to the top of the globe and pull it tight, wrapping it down to the bottom of the globe. Space them in a fairly even manner. 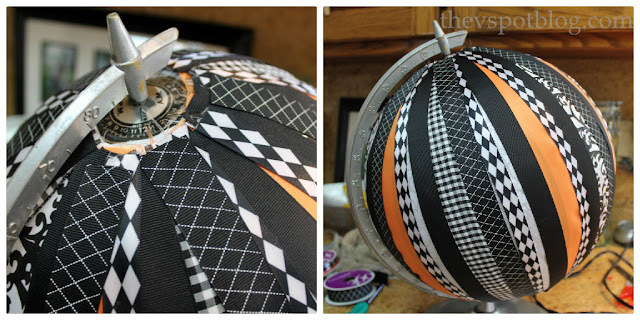 When the top of the globe is covered with the fabric from the ribbon, that’s the time to fire up your glue gun. Put a dab of hot glue on the end of a length of ribbon and glue it to the ribbon “base” that is stuck on with the sticky dots. Add another dab of glue to the other end of the ribbon and pull it down firmly across the globe and secure it to the bottom. You want to pull the ribbons tight across the globe so that they will lay flat. Something to note: you will be pulling the ribbon from the top point on the globe down to the bottom point on the globe. It’s held in there at an angle, so the best way to keep the ribbon fairly straight is to go from point A to point B. Keep adding layers of ribbon until the whole globe is covered. I found the best way to do this was to do one kind of ribbon at a time and just keep turning the globe in order to evenly space them. So then what to do with the raw edges on the top…? I tried wrapping ribbon around it. Um, no. I tried to do a little fringe of ribbons… wasn’t really feeling it. Tried to cut out a black circle to “cap it off”. Major fail. Then I remembered these little silver leaves I bought for no other reason than that they were on clearance for 22 cents. I dug into my stash and hot glued them, overlapping in a circle. A thinking girl would have thought to rub them with a black stamp before gluing them onto the globe, but apparently I am not a thinking girl. Saweeeet! Now for some reason when I read globe in the title I was thinking snow globe not world globe… So the mental picture I was preparing myself for was MUCH different! Lol. This is lovely! What a great idea too. I just saw this on Pinterest, and just had to stop by because I LOVE it! 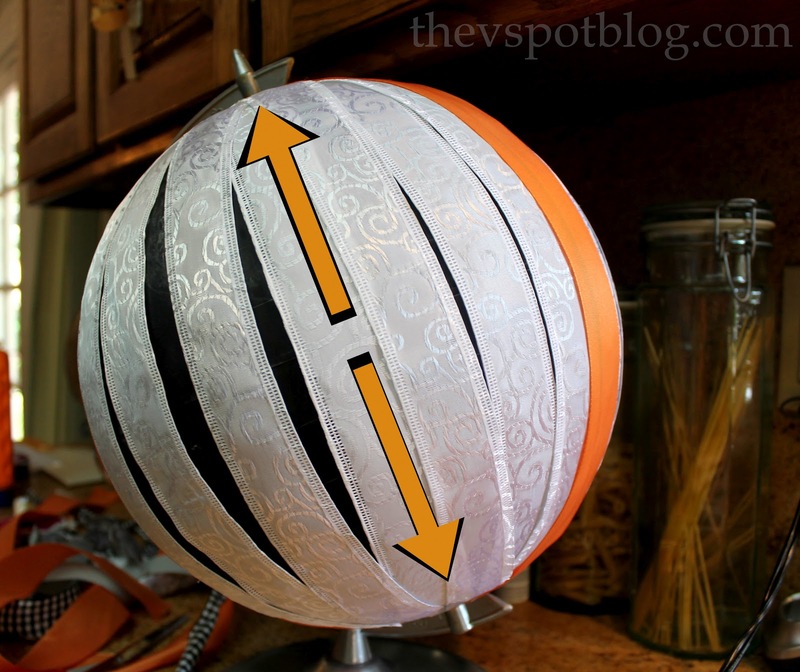 Oh my gosh, I just saw a globe at Goodwill yesterday, I’m seriously going back today to pick it up so I can make one of these. Well done! You really should start selling the things you make! I am always so amazed and I know it probably seems to simple to you to whip these up but I think you have a great eye for it! CUTE! Now I need a globe! That is cute. Do not add feathers! I love this project, and this was so NOT a craft fail. I agree with Bliss, put the feathers down ma’am. Fab-u-lous! This is a really cool idea, and I LOVE the ribbon you used and the silver leaves are awesome, too! lovely globe! awesome job! I dig it, Vivienne! You can change it out for all the holidays too. Sweet. I love what you did with this globe. Talk about thinking outside of the box (or orb as the case may be) ~ kudos! This is so cool! First of all you had me at chalk board painted globe but I love the idea to temporarily change it up with the seasons. 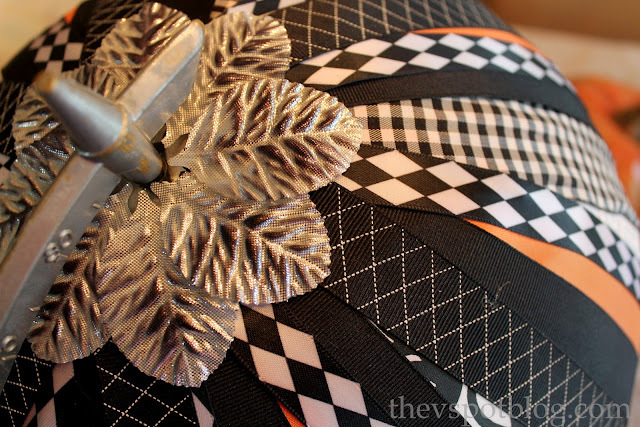 The ribbons are so elegantly festive and I absolutely LOVE how you finished it off with the silver leaves at the top. What a great idea! I love the ribbons and the leaves on top finish it of perfectly. That is a super creative idea. 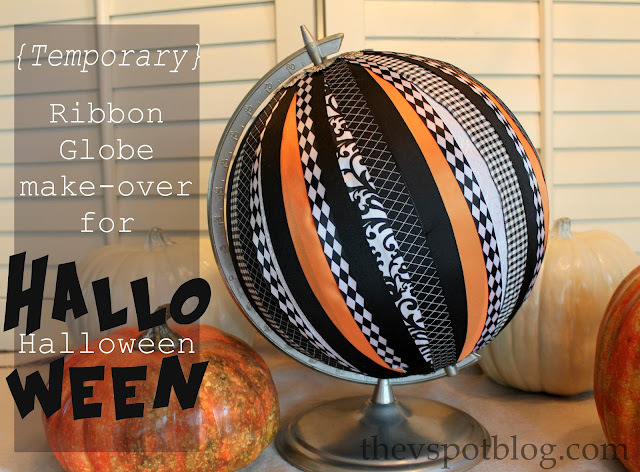 I love the ribbon on the globe and I love that it’s temporary so you can change it out with the seasons. I would love for you to link up to my Fall into Fall party that opens at 8pm EST tonight. Hope to see you there. You are rockin’ the pumpkins this year! 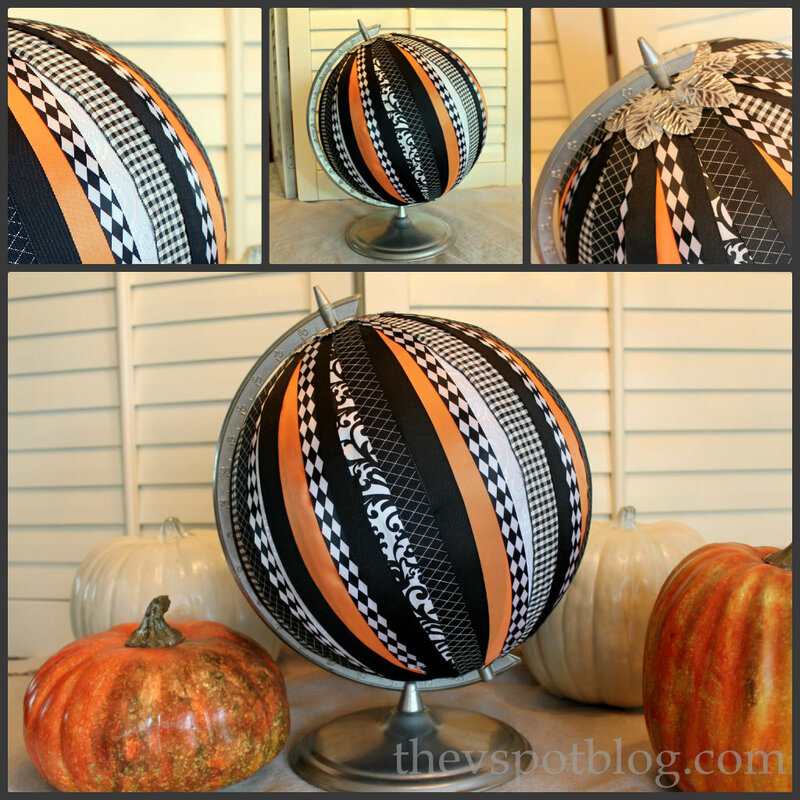 This globe/pumpkin is fantastic! I tell ya, you’re one smart cookie. Such a great idea! I’m excited to see what other cool things you come up with for Halloween! Such a cute idea and great deco for Halloween!